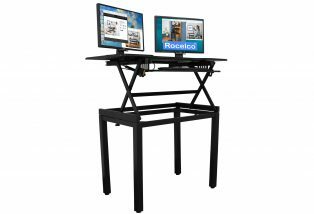 The DADR-40-FS and DADR-46-FS standing desks offer all the advantages of your current sit only desk plus they allow you to raise the entire desk top, so you can stand while you work. 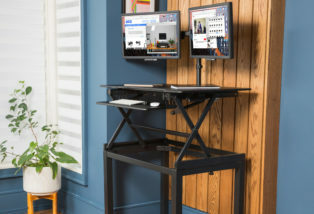 The DADR Sit Stand Desks come in 2 convenient sizes, either 40” (DADR-40-FS) or 46” (DADR-46-FS) wide. Both sizes offer plenty of room for multiple monitors and the rest of your stuff. 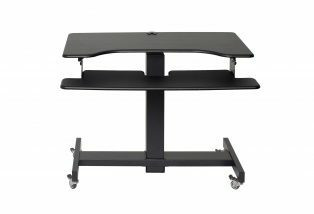 Both models also include a retractable keyboard tray, so you can be standing or sitting in the most comfortable and ergonomic position. The DADR Sit Stand Desks also include a grommet hole to hold one of our convenient monitor arms (DM1 Single, DM2 Double or DM3 Triple), or it can be used to organize your cables. The DADR Sit Stand series offer one of the most cost-effective and efficient sit stand desks available. They can be used alone or as an extension to your current desk. The DADR Sit Stand Desk is easily assembled in about 5 minutes. You can quickly get set up and start working within minutes.